Mechanized Warfare is the use of armored and motorized vehicles and weapons and usually involves rapid movement over long distances. In other words, it is when people use machines to fight a war. Vehicles include the use of trains to move troops and supplies, cars and trucks, tanks, submarines, battleships, aircraft carriers, and planes. Weapons included automatic rifles, torpedoes, machine guns, and howitzers. HOW WAS MECHANIZED WARFARE USED IN WORLD WAR I? World War I was the first war in which machines were used as the main means of fighting. Before World War I, war was mostly conducted using man to man combat. Keep in mind that industrialization had just occurred before World War I. The assembly line, division of labor, interchangeable parts, and factories had made creating anything mechanical easy to create and quickly produce in large amounts. New inventions and advances in science also contributed to the use of mechanized warfare in World War I. Advancements in firepower contributed to the use of mechanized warfare in every venue of war. Automatic rifles and machine guns now made it easier to keep continuously firing without having to constantly reload. Explosive shells were also developed allowing one soldier to stop many soldiers from the opposite side at once. World War I also was the first war using air raids and dog fights. Zeppelins and airplanes dropped torpedoes and did reconnaissance and surveillance. 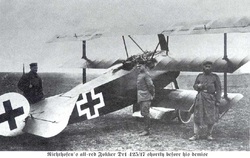 Airplanes used machine guns for the first time in dogfights between the Allies and Central powers. The famous Red Baron was a german plane ace during World War I who was famous for winning elaborate dog fights. Tanks were another new weapon used in World War I. Tanks were developed to end the stalemate that World War I had become. Not only were tanks covered in armor which made it harder to stop, but it could trample barbed wire and other barricades set up in trench warfare. They were armed with heavy guns allowing the tank to not only protect those inside and infiltrate enemy lines, but also kill large numbers of enemy soldiers along the way. Battleships such as the famous Dreadnought were another way mechanized warfare was used in World War I. The battleship had already been invented but the Dreadnought used heavier armor and more sophisticated guns. These guns could do heavier damage over longer distances than the battleships before it. Battleships weren't the only naval improvement though. 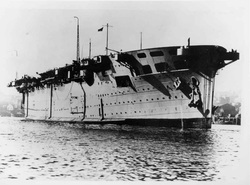 Because airplanes were now used in war, the aircraft carrier was invented so that planes could take off on water. Probably the most important naval development however, was the submarine. Submarines went under water and could sneak up on a battleship before the battleship even knew what hit them. WHY WAS MECHANIZED WARFARE USED IN WORLD WAR I? As stated earlier, mechanized warfare developed after the industrial age. Mechanized warfare allowed both sides to use less people to do more damage. It helped protect more of their own troops. But as you have learned, necessity is the mother of invention. The stalemate that trench warfare caused made it necessary for both sides to come up with other ways of gaining ground in war. Improvements in weapons and transportation made this possible. Mechanized transportation and weapons had many advantages and disadvantages when they were introduced in World War I. All new inventions will have kinks that need to be worked out. These weapons were issued as quickly as they were invented. Many were unreliable. For instance, tanks would often break down leaving the crew inside stranded on enemy territory. 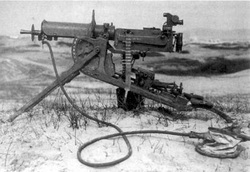 Machine guns had a tendency to jam, allowing the enemy to charge if another machine gun was not ready to replace it. Inventions like gas masks did not account for the changes in wind when they were first developed. So a change in the wind could cause a troop to gas themselves. Another issue was the time it took to set up weapons. Some weapons like the howitzer gun was so heavy it took a crew to set it up. Weapons such as mines took time to dig and exposed soldiers to the other side in trench warfare. The advantages however, far outweighed the disadvantages. Whether these weapons were unreliable, heavy, hard to move, or took time to set up was minor to the amount of damage they could do to the opposite side. One man or a small team of men could wiped out dozens to hundreds of soldiers on the other side. Because these weapons were used immediately after invention, they were improved quickly. This ironed out many kinks and made the weapons even more effective. It also paved the way for new types of weapons. Because of weapons research and strives to improve weapon technology, World War II saw the most destructive weapon ever known to man - the atomic bomb. Whether it was an advantage or disadvantage is debatable but the atomic bomb used in World War II won the war for the U.S. against Japan.